Q: After making changes on the document and then sending to other users, the document can not be opened by other viewers. How can I fix this issue? A: First, when you’re facing this issue, please send us an email by going to Help -> Email Support so that our development team can investigate and attempt to resolve the issue. When emailing support, make sure to also send us a copy of the document you are working with as well so we can better assist you. 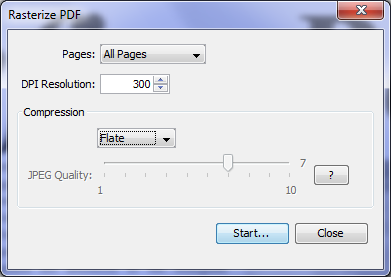 Method 1: Using the “Rasterize” feature (Available since PDF Studio 10) to convert the pages to images. Select the compression options. We recommend using the “Flate” option as this is a lossless compress that will not reduce the quality. However, Flate will result in larger documents so another compression option may be better if the file is extremely large. Note: When using any of the above methods to generate a new PDF any of the annotations or markups on the document will be flattened and no longer be editable. Make sure to save the original document prior to completing any of the above methods.